1. 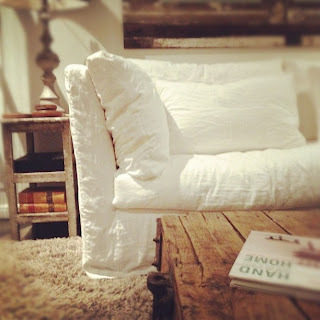 Do you make slipcovers? How do I get a slipcover made by you? Yes, I do make slipcovers. I've made custom slipcovers for sofas, love seats, parsons chairs, wing backs, chaise lounges, dining room chair seats, ottomans...you get the picture. Pretty much anything can be slipcovered. However, I am limited for what I can do for you by the distance between us. At this time, I am only able to do furniture if it is accessible to me. To get the custom fit that I like, I need to be able to have it in studio, to see it in person and work with it as I progress. But don't despair! There are companies out there who can do it...just not me...not yet :) If you are close enough to me in Fullerton, CA 92832...then give me a call and we can set up an appointment to get started. 2. I live too far...Can you refer me to someone that can do remote slipcovers? Absolutely! There is a company (here) that is able to make slipcovers for you using pictures and measurements that you provide. I don't have any first-hand experience with them, but you might want to check them out. If you do have experience with them, I'd love to hear how it went so I can feel more confident about referring them. 3. How much fabric will I need to slipcover ? Here's the chart I use when estimating yardage needed for slipcovers. Let me know if you need help deciphering it. 4. Do you have fabric or do I need to supply it? Yes, I do have fabric that you can use. However, you may also supply it as well. Fabric and labor charges are itemized separately so you can pick and choose which way you'd like to proceed. I carry 100% linen in about 50 different weights and colors. I also have accounts with P. Kauffman and Covington if your budget isn't a concern and we are needing lots of yardage.You can see all of the colors available here in my studio. I can also ship swatches to you so you can see them in person. 5. Should I wash the fabric? How do I clean slipcovers? How do I keep them from shrinking? "Real life" living with kids, pets, snacking on the sofa, etc. is just something I've come to accept. For me, the biggest advantage of having slipcovers is the ability to take them off and throw them in the washing machine. I encourage all of my clients to plan on cleaning them that way as well... and with that...you must pre-wash your fabric. To really get the fabric to shrink as much as it can, I like to use hot water in the washer and high heat in the dryer. It's a pain to take this step, after all who wants to spend time and resources dealing with yards and yards of fabric getting through the laundry. However, this allows any shrinkage to happen prior to cutting, thus keeping your custom fit slipcovers from being too small after their first trip to the laundry in your home. If you are buying the fabric from me, price includes me doing the prewash/dry/iron for you. 6. What does it cost to slipcover my _____________? Prices for labor are dependent on a few variables (skirt style, ruffles or not, fabric repeat or difficulty sewing, etc.) but to give you a ballpark idea...a wing back chair ($220), an overstuffed chair with 2 cushions ($270), a sofa with 4 cushions ($500), a parsons chair ($100), a dining chair seat ($50), and an ottoman ($100). Email me at mrslemon@sbcglobal.net with a picture if possible, details you want, etc. and I can give you a firmer estimate.